Is not this the carpenter, the son of Mary, the brother of James, and Joses, and of Juda, and Simon? and are not his sisters here with us? (Mark 6:3). But other of the apostles saw I none, save James the Lord's brother (Galatians 1:19). In the 1970's a Jewish collector bought an ossuary from a dealer for a few hundred dollars that was allegedly found in the village of Silwan below the southern wall of the Old City in Jerusalem. Archeologists have unearthed thousands of such boxes. This box was limestone with the Aramaic inscription on it Ya'akov, bar Yosef, akhui di Yeshua, James, son of Joseph, brother of Jesus. It weighs about 45 lbs., and measured 10 inches by 12 inches by 20 inches, just long enough to accommodate the longest human bone, the femur. Let us say at this point, lest we be blamed of building faith on archaeological discovery, and of walking by sight rather than faith, that the point we would like to emphasize is that all archaeological discoveries, if they be true, must conform to the truth of the Scriptures. And again, this is what such discoveries do, for there has not been one shred of archaeological evidence in this age of digs that speaks contrary to God's Word, the Bible. Flavius Josephus was a Jewish historian who wrote during the first century A.D. He mentions that James was stoned to death as a heretic in A.D. 62, and described him as the brother of Jesus, who was called Christ (The Antiquities of the Jews 20:9:200). In the Bible, Paul calls him the Lord's brother (Galatians 1:19). This of course poses a theological problem for the Roman Catholic Church since they teach that Jesus' mother Mary was a perpetual virgin, and therefore cannot admit blood siblings. The find of the ossuary of James, the brother of Jesus however, is yet another stumbling block for the Holy Tradition of the Roman Catholic and Orthodox Churches. These churches have far too long blurred their senses with candles and incense and holy waters and costumes and the liturgy and rituals, etc. If they would but turn from their Sacred Tradition to the very Word of God they claim allegiance to, they would here find that Joseph knew her [Mary] not till she had brought forth her firstborn son (Matthew 1:25). Joseph knew Mary in a knowledgeable sense before Jesus was born, for the Bible says that Joseph was already her husband (Matthew 1:19). It was Joseph who brought her to Bethlehem to be delivered of the child Jesus. Hannah had conceived, that she bare a son (1 Samuel 1:19). Lot had two daughters which have not known (same Hebrew word) man (Genesis 19:8). As well, in one of the Messianic Psalms it is written, Because for thy sake I have borne reproach; shame hath covered my face. I am become a stranger unto my brethren, and an alien unto my mother's children. For the zeal of thine house hath eaten me up; and the reproaches of them that reproached thee are fallen upon me (Psalm 69:7-9). Obviously His mother had other children. Because men call their teachings or traditions holy, it does not necessarily mean they are true. James like all others needed to be saved. Being the brother of the Lord would avail him no merits before a Holy God whose wrath is kindled against all sin. Men are not saved because they are members of a godly family or by the church they attend. In Jesus' early ministry it is recorded, neither did his brethren believe in Him (John 7:5). These also needed to come to the place where they repent and believed that Christ died for their sins and that He rose again from the dead, and receive Him as their Savior. It is clear that James came to this place, possibly after He seen his risen Savior. He has a book in the Bible by his name and was a pillar (Galatians 2:9) in the early church. We should take note that James, not Peter, sat as the leader in Jerusalem giving his sentence (Acts 15:13, 19) there at one of the most important councils where "the faith" concerning the common salvation of believers was earnestly contended for. To who we gave place by subjection, NO, not for an hour; that the truth of the gospel might continue with you (Galatians 2:4-5). Peter as well spoke up saying how the Gentiles were saved by the grace of the Lord Jesus Christ, God having purified their hearts by faith after they heard the word of the gospel and believed (Acts 15:7-11). These false brethren (Galatians 2:4) believed (Acts 15:5) that Christ died for our sins, was buried, and rose again from the dead. They believed in God, but the way of salvation they knew not. The glorious gospel of Christ they were perverting (Galatians1: 7-8), teaching things which they ought not, denying the Lord who bought them by adding to the substitutionary death of Christ for our sins, their own good works, turning the truth of God into a lie. Adding to the cross of Christ, the glorious gospel of Christ, anything (baptism, good works, circumcision, the ten commandments, church membership, giving alms, praying, etc. ), makes it a perverted gospel that cannot save, a false gospel that brings damnation to the souls of those who would preach it. Be sure that you know precisely what the saving gospel is and what you must do to be saved; your eternal soul depends on it. That we should be to the praise of his glory, who first trusted in Christ. In whom ye also trusted, after that ye heard the word of truth, the gospel of your salvation: in whom also after that ye believed, ye were sealed with that holy Spirit of promise, Which is the earnest of our inheritance until the redemption of the purchased possession, unto the praise of his glory (Ephesians 1:12-14). No doubt this would be a controversial topic, however, many there would be wbleepeddisagree with those wbleepedhave "proven" the ossuary of James to be a fake. There are a couple of good articles on Answers I Genesis. Do a quick search there. 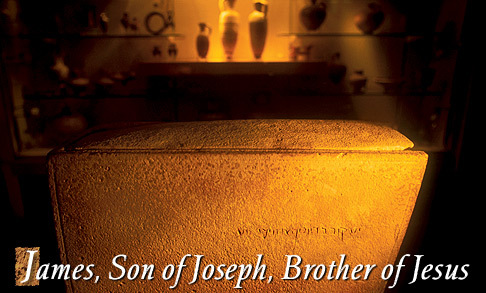 The so-called ossuary of �James, the brother of Jesus� was proven to be a fake.